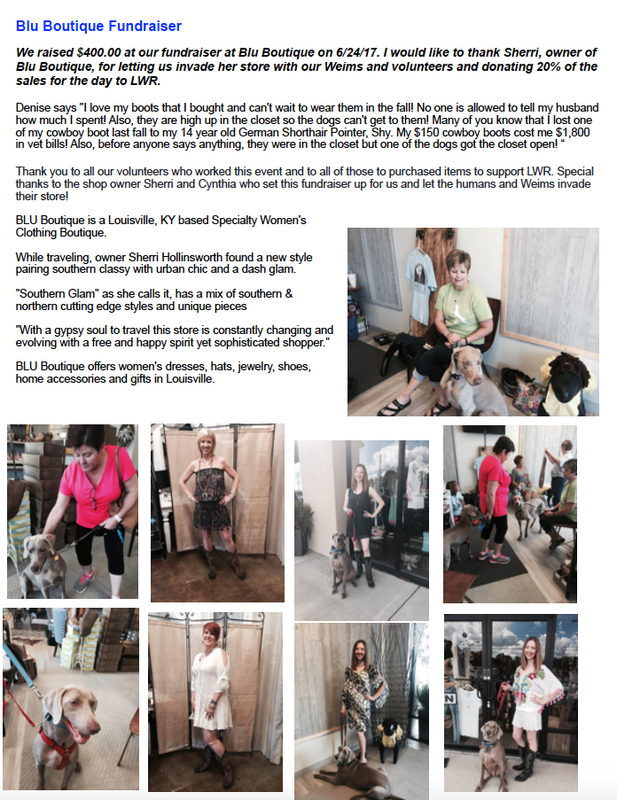 SHOP/RAISE FUNDS FOR LWR | Louisville Weimaraner Rescue Inc.
Like to help Louisville Weimaraner Rescue in a big way? Buy something for yourself. Better yet, buy a lot of somethings for yourself! Below you will find several companies that we have teamed up with that will send Louisville Weimaraner Rescue donations. Each company’s website has specific directions, and we hope to add more companies soon. Please check our website for updates regularly so that our rescue continues to be funded as needed. We have many products in our shop that were generously donated and/or lovingly crafted to help us raise funds! We have a great assortment including picture frames, Designs by Janvi, Snoods, Note Cards, Totes, Jewelry and more! Check out our shop! For every item purchased, 10% will be donated to Louisville Weim Rescue. Bravelets™ is not a non-profit organization. We are a for-profit company with giving at our core. We believe in transparency. We believe in making a difference. We don’t believe in the phrase “a portion of proceeds will be donated . . . ” What does that mean? What portion, what proceeds? That kind of giving is confusing and unfulfilling to the customer. Our giving is clear, transparent, and easy to understand. When buying a product from Bravelets, you always know the exact amount being donated, and exactly where it is going. We want you to be confident in your purchase, and proud to have made a difference. When you shop at AmazonSmile, Amazon will donate 0.5% of the price of your eligible AmazonSmile purchases to Louisville Weimaraner Rescue whenever you shop on AmazonSmile. At iGive.com you get free membership; access to the over 600 brand-name merchants like Barnes & Noble, Eddie Bauer, Lands’ End and PETsMA; super savings and deals every day; and of course, free donations to Louisville Weimaraner Rescue! Join www.iGive.com/louisvilleweimrescue, and then shop ’til you drop. We’ll appreciate it! There is a new and easy way to raise money for Louisville Weimaraner Rescue just by searching the Internet with GoodSearch.com. It’s simple. You use GoodSearch.com like any other search engine — the site is powered by Yahoo! — but each time you do, money is generated for Louisville Weimaraner Rescue. Not only do we provide the best shopping deals on the internet, but we also make a donation to the nonprofit or school of your choice for almost every purchase you make. That’s right: when you shop with Goodshop you don’t just save. You also give, at no extra cost. We like to say that we have the most powerful coupons in the world. We hope you will pass this message on to your friends and family. The more people who use this, the more money will go to Louisville Weimaraner Rescue. Go to www.wooftrax.com and download the free app. Select Louisville Weimaraner Rescue as your charity. We are currently listed under the state of Indiana. Introducing WoofTrax Walk & Win Challenge. Your next walk could be a winning walk! Learn more, and see a list of winning walks on our Walk & Win page. Go to http://resqwalk.com and download the app! ResQwalk is a FREE mobile app that enables you to raise money and resources for animal welfare organizations simply by walking. Each month we announce a ResQpool of cash and other resources that have been provided by corporate sponsors. 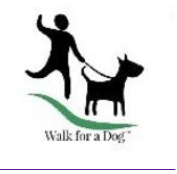 In order to earn part of the pool for your favorite animal welfare organization, all you have to do is download the ResQwalk app and choose Louisville Weimaraner Rescue and start walking!